King Juntal is one of an estimated few hundred artists in the country who sing Rhumba music. The Mutupo hit maker affectionately referred to as the King of Rhumba on Saturday launched his highly anticipated album “Kwatinobva” powered by the number one station (Power FM) at Pagango and it was lit. Juntal was blown away by the turnout, love and support that he got from his fans and he was very grateful to power FM for what he described as great marketing for his album launch. 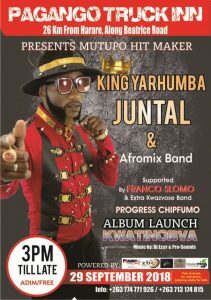 “Thanks to power FM for making my launch nothing but a success,” King Juntal told Power FM News.